I can’t remember a nicer March. We’ve had 9 days in the 50’s and 8 days above 60 degrees. All of these warmer-than-usual days inspire us to get in the car, enjoy a ride on a sunny day,do something different, take a day trip. About 35 miles northwest of downtown Detroit is the city of Plymouth; beautiful historic homes, parks and a vibrant downtown filled with independent restaurants and shops make it an attractive destination. 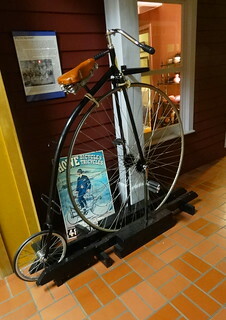 Our first stop is the Plymouth Historical Museum on S. Main Street. 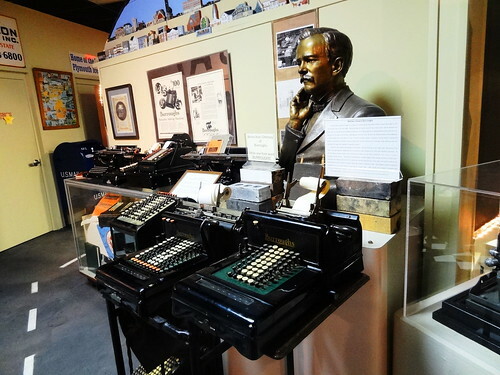 I have to admit I really enjoy visiting local history museums, not only does it shed light on what makes the city unique, it also shows us what we have in common. I always end up saying something like: they made that here? Or, that’s where that comes from? I’m always learning something new. 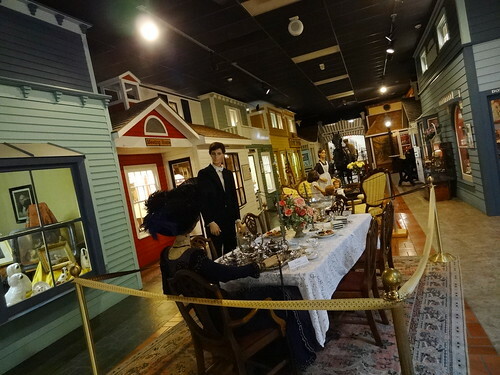 Inside the museum we pay the admission fee, climb the stairs to the second floor and find ourselves in a re-creation of Main Street, circa the late 19th century. 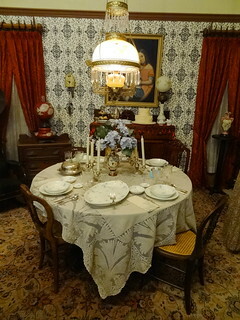 The exhibit theme through June 12 is Downton Abbey. 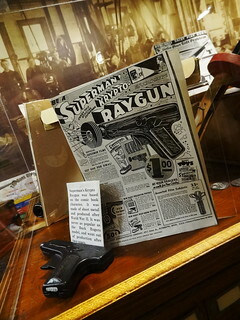 Items from the museums extensive collection of historic clothing and artifacts are arranged to highlight the events of the popular television show comparing them to what was going on in the US at the time. Beautiful Victorian items fill parlors with bold-patterned wallpaper, heavy drapes and busy rugs. 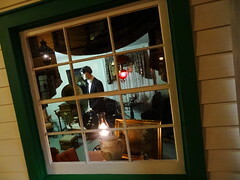 Shop windows are cluttered with clocks, carnival glass, knickknacks, plates and Birth Banks–popular at the time. 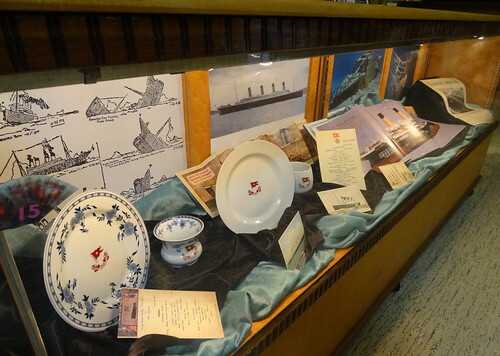 There’s a general store and a dentist office, reproduction items from the Titanic. Queen Victoria (1819-1901) reigned Great Britain and Ireland for 63 years, a period now known as the Victorian Era, it was a time of industrial, cultural, political, scientific and military change. 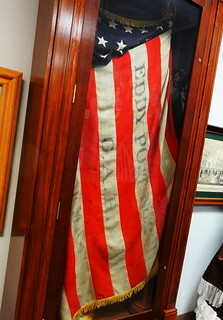 Off in a corner sits a permanent display from the office of the President of Daisy Manufacturing, a fireplace surrounded by dark wood paneling, a small table and seating area looks cozy; more on Daisy later… With the purchase of the Weldon Petz Abraham Lincoln collection, the Lincoln Room opened in 2002. 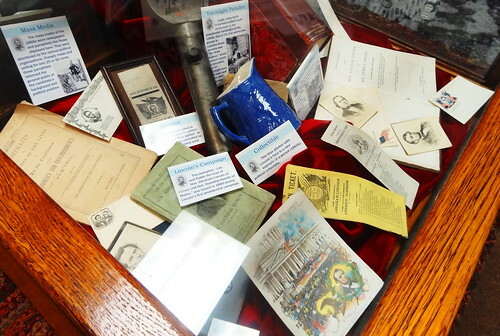 Display cases hold artifacts from Lincoln’s youth, the books he read as a boy, rare family photographs, handwritten legal documents, artifacts from the assassination, even a lock of his hair. 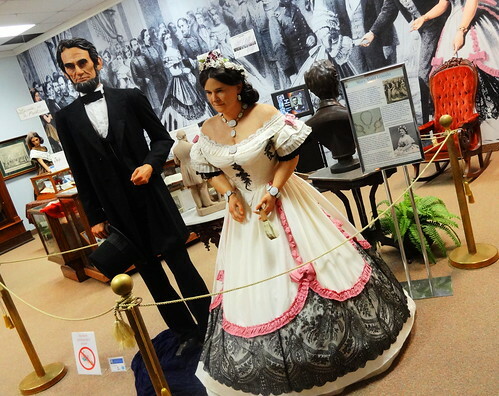 This is the largest Lincoln collection in the state of Michigan, it’s absolutely fascinating to see. 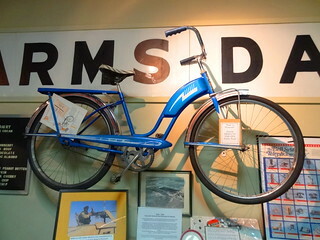 The museum’s lower level is dedicated to the timeline of Plymouth from the native tribes to modern times. This is our favorite part. 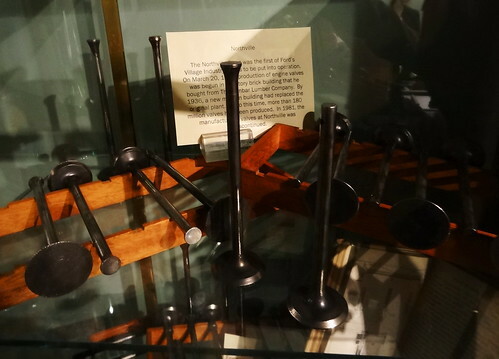 We wander into an exhibit featuring the Phoenix Plant, one of Henry Ford’s Village Industries. 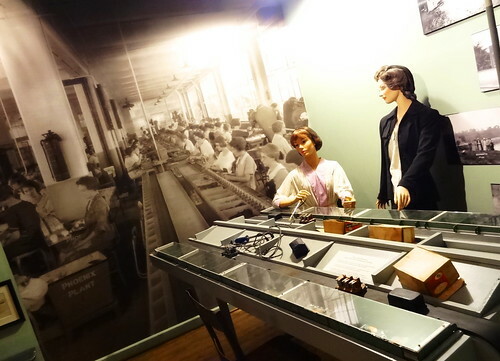 In this small-scale factory the all-female employees made generator cut-outs, voltage regulators, gauges and light switches for Ford vehicles. This was the first factory in the US to pay women the same rate as men. Be sure and watch the videos, the women’s stories are amazing! The factory was open from 1922-1948. Next door is the Daisy Air Rifle room, it’s super-cool. 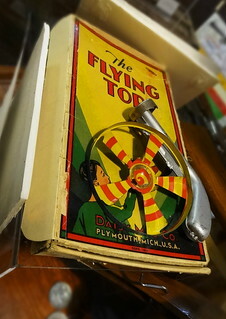 What a story–The Plymouth Iron Windmill Company ended up making the most popular air rifle in the country. 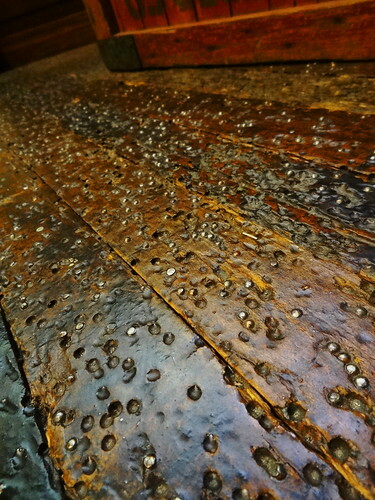 They brought actual items from the old Plymouth factory to be used in the museum, including the original floor, bb’s and all–check it out. 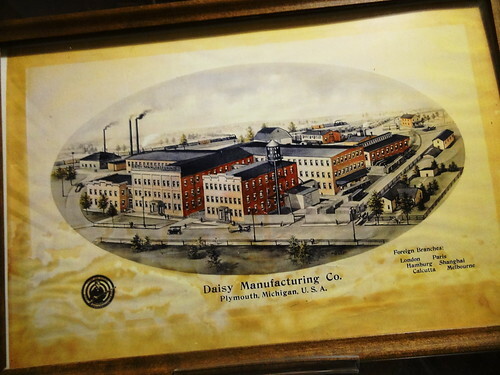 Did you know Daisy made the world’s first water pistol, the Squirt-O-Matic in 1913? The Made In Plymouth section is next. 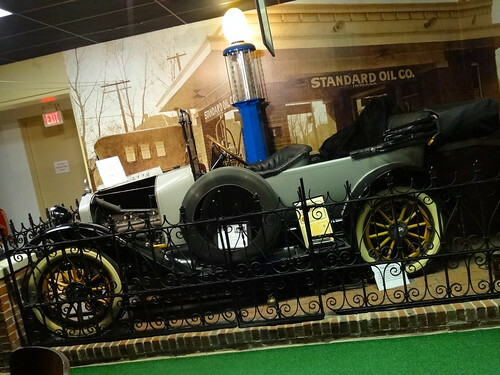 The Alter Company was in business from 1914-1917, this is the only Alter automobile still known to exist. The 1916 edition sold for $685, they even have an original stock certificate. We meander up and down aisles, the projector and seats from the Penniman Allen Theatre look really old, we see a slice of life during WWII; what a kitchen looked like, a crazy machine used for giving women a permanent wave, personally I think I’d have stuck with straight hair… Dozens of portable adding machines from the Burroughs Company fill glass cases and shelves, an Evans bicycle hangs on the wall, typewriters and telephones were made here too. 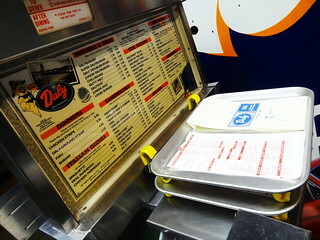 A sign, speaker, menu and trays from Daly brings back memories. The first Daly Drive-In opened in the summer of 1948, serving Dalyburgers, Dalydogs, banana splits and shakes, it was a favorite hang out for decades. One location remains on Plymouth Rd. in Livonia. Cloverdales soda fountain and Kemnitz Fine Candies are also represented. I’m getting hungry.The Plymouth Historical Museum, as it exists today, is due in great part to the generous donations of Miss Margaret Dunning. Margaret, a businesswoman and philanthropist, lived in the same house on Penniman Ave for over 90 years. She passed away in 2015 at the age of 104, her legacy lives on. 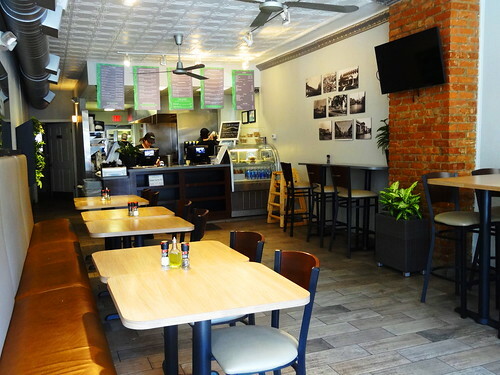 We head downtown for lunch, Simply Fresh Mediterranean Grill looks inviting. The space is bright and airy with a white tin ceiling and walls. Menu items are made fresh from family recipes and traditions. We order at the counter, while we wait we notice black and white historical photographs; one group is Plymouth, the other a small town in Jerusalem the family came from. We are sitting in a cozy space in front of a sun filled window when the food arrives, one plate after another of tasty Mediterranean fare. 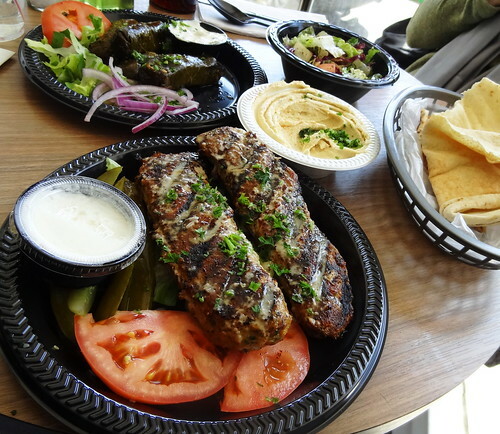 We get our usual favorites: hummus, fatoosh, stuffed grape leaves, and a new dish to us, Chicken Kifta. Ground chicken mixed with onions, parsley and spices, grilled and served with pickles and a side of garlic sauce, the food is beyond delicious. 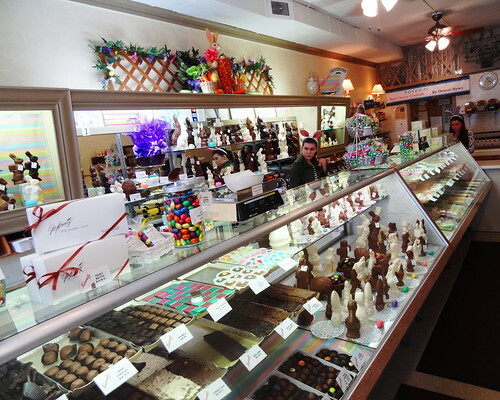 We’re pretty full, but something sweet would be nice, Kris suggests chocolate; we know just where to go. 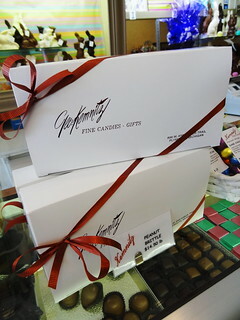 Kemnitz Fine Candies has been making homemade candies and chocolates fresh daily since 1951. 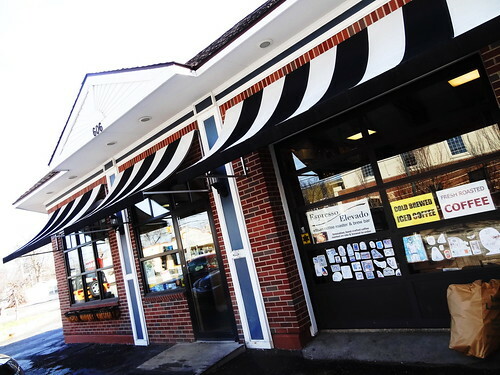 The little shop on Ann Arbor Trail has been a favorite for generations of Plymouth families, this is our first visit. Gold letters above a striped awning direct us inside the shop, it’s crazy busy, Easter is tomorrow. Everywhere I look I see bunnies made of milk, dark and white chocolate wear identifying numbers, bags of pastel foil-wrapped chocolate eggs, individual chocolates and jelly beans. Girls behind the counter wearing bunny-ear headbands wait on customer after customer, our turn. We each pick a couple of items, all we need now is coffee. At Espresso Elevado on Main St. you can get a fantastic cup of coffee, an espresso drink, loose-leaf tea or coffee beans roasted on-site; we’re here for the cold brew coffee. 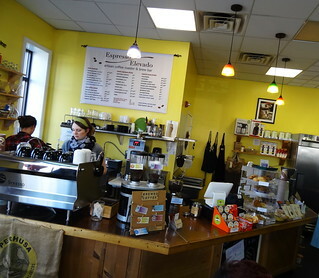 Bright yellow walls surround tables and chairs, a cooler with cold drinks, the counter crowded with organic and local pastries and chocolate from Mindo Chocolate Makers in Dexter. We wait in line and hope space opens at one of the tables, we’re in luck. 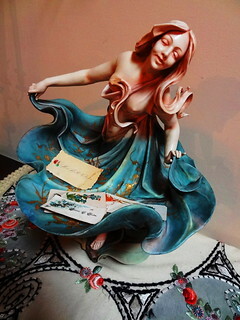 I retrieve the bag of chocolates from Kemnitz, wow, incredibly good, is there anything better than coffee and chocolate? I’ll have to think about that one…..